Thomas Blampied's Railway World: Helping "The Guy with a Train in His Basement"
Helping "The Guy with a Train in His Basement"
Sometimes (like when you are concentrating your time on releasing a book) certain projects get put on the back-burner, not because they aren’t good, but because you haven’t the time to do them justice. This is one of those projects. 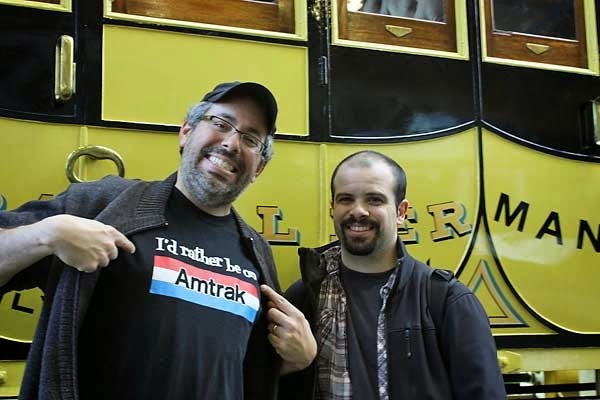 Last December, I learned that Jason Shron, head of the extremely successful Canadian model railway manufacturer Rapido Trains, was going to be visiting the UK, including a special event in Crewe. Unable to head to Crewe, I dropped him an email saying that it was a shame he wasn't visiting York. He quickly replied that he was. Indeed, he did visit York along with his colleague Dan Garcia, and I was their guide for the day. Jason and Dan discover the replica of Stephenson’s Rocket. The most memorable event from the visit was Jason and Dan browsing through York's premier model railway shop. Anyone familiar with Rapido's beautifully-detailed models will appreciate that Jason is very exacting when it comes to all model trains. I felt a little sorry for the shop as most UK models he saw simply weren't up to scratch and failed his critical appraisal. One of the main reasons for the trip (apart from the Doctor Who anniversary celebrations) was to begin the process of developing Rapido's first foray into the British model market. They had told me what it was, but I was sworn to secrecy. Months later, the APT-E project was announced to great acclaim. After their brief York visit, Jason and Dan headed back to Canada while I settled back into my normal York routine. Fast forward a month and an email from Jason appears in my inbox. While I had filed their secret project into the back of my mind, Jason had been hard at work with the Rapido team and organizations in the UK working on the project. In his email, he asked if I might be able to help by browsing through some files in the National Railway Museum's (NRM) archives, a mere 10-minute walk from my flat. As an historian, I love research. As a railway enthusiast, I love trains. How could I say no? Overview of the APT-E, courtesy NRM. And so it was arranged. I spent two days pouring over the plans for the train in question - about 50 boxes of film from the 1970s. I was looking for the drawings which would help Rapido design their model, exterior plans, underframe details and anything else that would be visible on a OO gauge model. Two things struck me about them. Firstly, how fine an art drafting is. Most of the drawings were hand-drawn by actual people, unlike today's CAD-generated printouts. 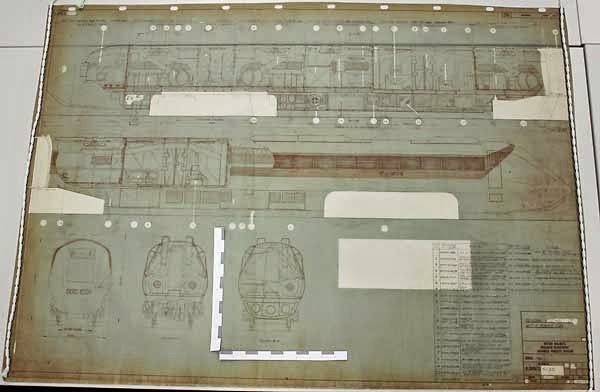 Secondly, I was surprised by how quickly electronic technology had become part of train design; the vast majority of the drawings were circuit diagrams. Whereas a steam engine didn't need any wiring, by the 1970s trains were increasingly powered by silicon chips and copper wire. During my hunting, it struck me that some of the more "photogenic" plans had disappeared, likely as souvenirs when the APT-E project was shelved. Nevertheless, there was enough of a complete picture to allow the initial designs to begin. Negatives of the APT-E test runs, courtesy NRM. With the plans sorted, Jason asked me to examine the NRM's collection of APT-E photographs. Again, it took two days to sort through the prints, negatives, transparencies and promotional material of the construction and testing of the high-speed train which was decades ahead of its time. Looking back, there weren't many images of the train in action, probably because it never entered revenue service. As such, the British Rail promotional department never went to town in the way that it did for the APT-P, which did briefly enter revenue service. I was, however, able to find enough good images for Rapido's promotional needs. Two days spent looking at photos of trains in the world's premier railway museum, what could be better? And so, I have actually been part of making a model! My research has helped to shape it. While I am a long-time buyer of model railway products, I have never thought much about how models actually comes to be on the hobby shop shelf. One of the best things about Rapido is that their newsletters offer a very candid glimpse at the design and production of their models and the rationale behind their pre-order distribution model. How many companies can you name that actually publish photos of their factory and working conditions in China? Whenever modellers whine about how manufacturers didn't make the right model, or wonder why it is taking so long for the next highly-anticipated release, they should appreciate how much time and resources are needed to get that train into stores. Skip ahead to the end of June. After months of speculation and building hype, Rapido (this time represented by Jason and his other colleague Bill Schneider) unveiled their APT-E model at the NRM's Shildon site to a very receptive crowd of modellers and the railway press. I have to admit, I thought Rapido trying to enter what is arguably the most saturated model railway market in the world was risky, but the reception has been very positive. Of course, I was there, lending a hand as photographer and general dog's body for the day. Along with manning the display booth, I helped to film what is probably the most unusual model railway promo video in history. "Carry On APT-E" has remarkably little to do with the APT-E, but is excellent visibility for the Rapido brand. 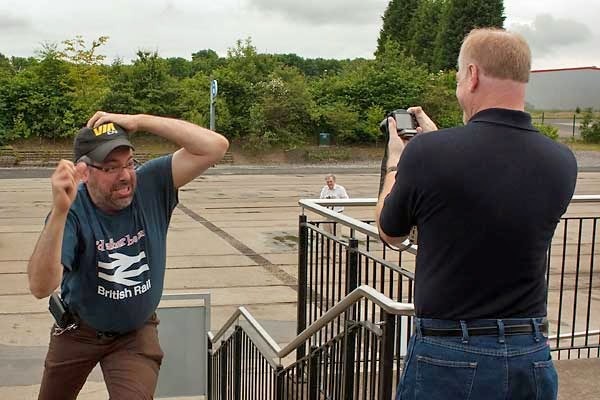 I helped film the great train chase, which mostly meant standing around for several hours and trying to reassure the drivers that Jason isn't actually as crazy as he seems. In fact, Jason and Bill spent three days filming the video (and sorting out admin for the project). They even managed to fit in a trip to York to visit the NRM. Of course, I served as their guide once again. So ends my experience of helping to build a model train. I gained archival experience and got to see how Rapido works (at least a little). Thanks to Jason and Rapido for the opportunity. I thoroughly enjoyed it.